Here’s some white privilege nonsense for you. It involves a young student named Robin. Robin believes there are “black” activities and “white” activities or things. Nobody makes black kids do “white” things, if you buy into the concept of “white” things. 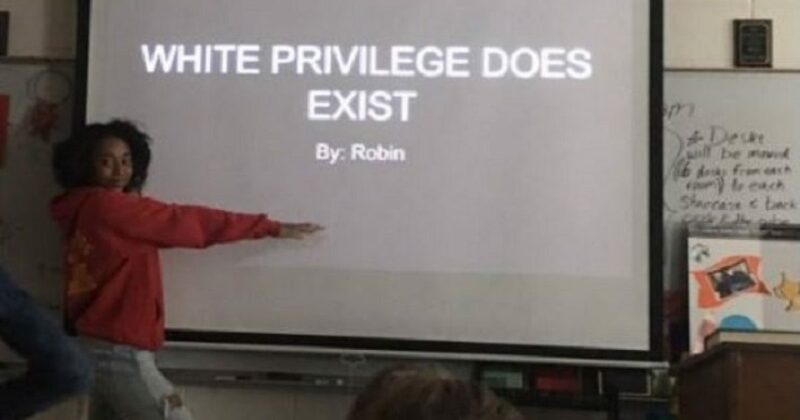 But many blacks think like Robin. So, for black Liberals, watching BET is a black thing. Also, listening to hip hop is a black thing. So what you may actually enjoy the music as a white person. For Leftist, you are doing a “black” thing. But when it comes to “white” things, there are apparently too many of them. For Liberals, white things are far too dominate. As an aside, I suggest that paying one’s bills on time is a white thing, but that’s just me. The Grio reported on what I call white privilege nonsense. A standing ovation for being a victim! Aren’t standing ovations for heroes and winners? I guess there just aren’t enough black things for Robin to do? When she ventures off the plantation to do white things, she confronts the notion that she’s a victim? How DARE she read Elle, instead of Essence! It’s the white privilege creeping into her life as a human, who happens to be black. Robin is not taught that there are only “human” things. If she eats Chinese food, is that white privilege or Asian privilege? Just curious. 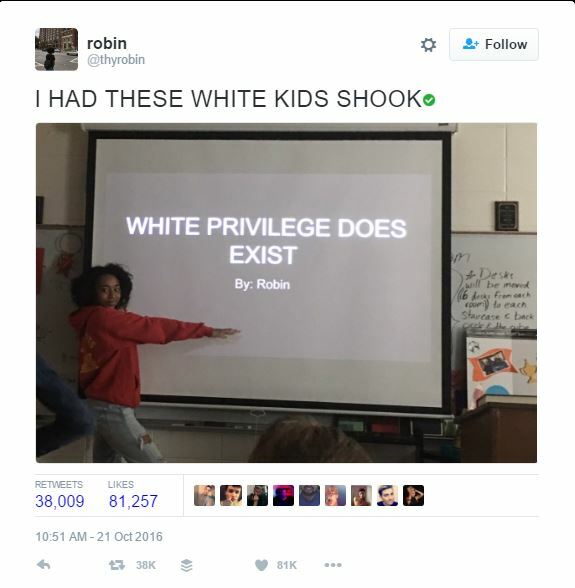 As you can see in the screenshot, Robin was happy to “shock” white people. She did her part to help them recognize their racism, none of which Robin knows or experiences. You see, Robin grew up in the least racist country in the world, and in the least racist time. Somebody told her that she was oppressed, so she bought into it. Now Robin is rewarded for her good works of beating down or “shocking” white people into political correctness.